Natural Drain Unblocker Pack of 12 is rated 3.8 out of 5 by 27. 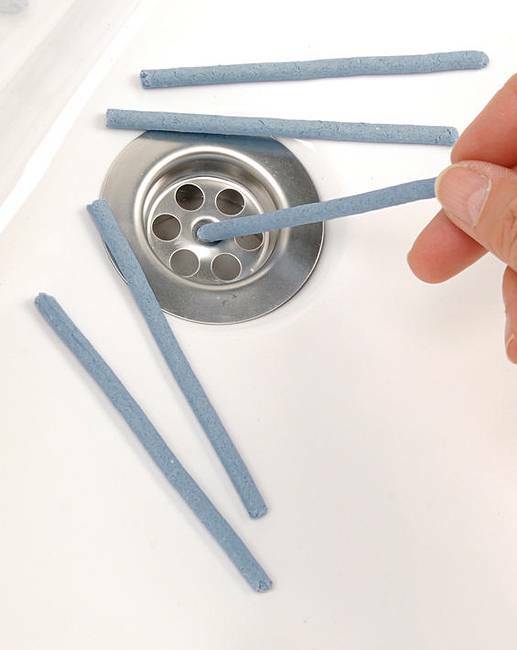 Just pop a biodegradable stick down the plughole and its natural, enzyme-based cleaner unblocks the drain of hair, grease, just about anything, without expensive or hazardous chemicals. One stick a month is all you need! Rated 5 out of 5 by Wrinkley from No mess. I have bought these handy unblockers before and think they are ideal for an elderly person living alone. Rated 1 out of 5 by Ginosmum from They don't work We have had these in the sinks in the kitchen and bathroom for 2-3 weeks and they haven't made any difference. save your money - they don't work. Rated 5 out of 5 by Nic 23 from Exactly as described I ordered this for my mum who swears by them. Do exactly as promised no worries! Rated 5 out of 5 by None from Effective Solution. I have bought these for some years, but found House of Bath cheaper than any other catalogue. Rated 1 out of 5 by okusama from Didn't work! Probably intended to prevent a blockage, but my sink was already blocked and they didn't work. I used 4 sticks but still didn't help. Rated 3 out of 5 by chippy from Not noticed anything yet Seems a bit mediocre, not found any difference. Quite pricey, did not receive offer of buy 2 get 1 free!